The Colourpoint Shorthair, an intelligent, affectionate breed, was created by crossing Siamese cats with American Shorthairs and Abyssinians. A sleek, svelte, elegant cat with a triangular face, large ears, long body, slender tail, and slanted blue eyes, the Colourpoint Shorthair is essentially a Siamese that is available in a broader range of point colours and patterns. Some cat organizations also recognize exotic point colours such as caramel and apricot. The Colourpoint Shorthair was developed by British and American breeders in the 1940s by outcrossing purebred Siamese cats with Abyssinians, American Shorthairs, and domestic shorthairs to introduce a broader spectrum of patterns and colours. The breed gained official recognition from the Cat Fanciers’ Association in 1964. However, there are some who continue to argue that the Colourpoint Shorthair is a Siamese hybrid rather than a separate breed. The British Governing Council of the Cat Fancy lists the Colourpoint Shorthair as a Siamese, though with its own breed classification. The Colourpoint Shorthair is a good choice for those who appreciate a clever, interesting, highly interactive cat, but a bad fit for anyone seeking a docile or independent feline companion. Like the Siamese, the Colourpoint Shorthair is a chatty, affectionate, sociable cat with a big voice and a lot of energy. Colourpoint Shorthairs are active, playful, athletic, mischievous, and graceful. They also tend to be lap cats, though some prefer to ride around on an owner’s shoulders or snuggle up beside their favourite human companions. Colourpoint Shorthairs have a tendency to follow people from room to room and don’t like to be left alone, so they make good pets for those who like to spend a lot of time with their cats. These cats tend to do poorly in households where everyone is out at work or school for most of the day. Like their Siamese cousins, Colourpoint Shorthairs are among the most intelligent cat breeds. They are also quite sensitive the feelings and moods of their owners. These cats tend to become more affectionate when their human companions are unhappy. 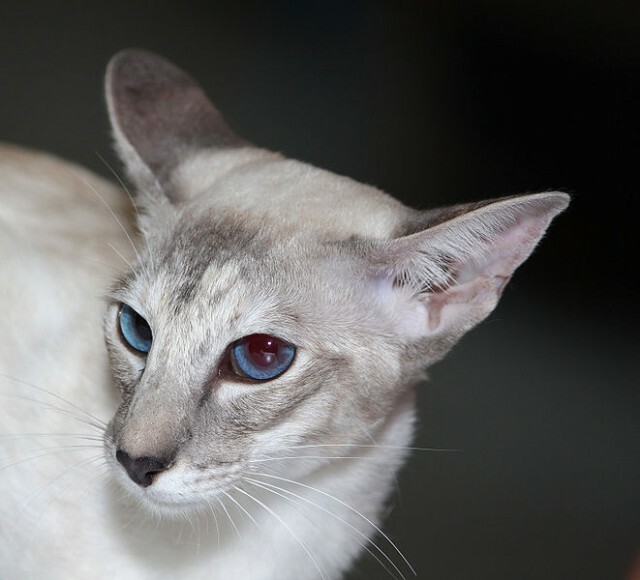 The Colourpoint Shorthair is, for the most part, a healthy breed that is largely free of genetic defects, though the endocardial fibroelastosis that plagues some Siamese lines can also be found in this breed. Siamese cats are known for their impressive longevity, and barring accident or disease, an indoor Colourpoint Shorthair that receives good food and care should have a longer-than-average life compared to most other cat breeds. Colourpoint Shorthair cats have short, sleek fur and tend to be clean and fastidious, so little if any grooming should be required, though rubbing the coat with a chamois can help remove loose fur, making the coat glisten like silk. Purebred Colourpoint Shorthair kittens typically cost $300-$400 USD. Those who wish to provide a loving home for an adult Colourpoint Shorthair can adopt through a breed rescue organization. See the Colourpoint Shorthair Breed Rescues page for a list of rescue organizations. For more cat breed articles, visit the main Cat Breeds page. For a full list of cat articles, see the main Cats page. Animal Planet. (2011). “Colorpoint Shorthair.” AnimalDiscovery.com. Canada’s Cat Registry. “Colourpoint SH.” CCA-AFC.com. Choron, S.; Choron, H.; & Moore, A. (2007). Planet Cat: A CAT-alog. New York, NY: Houghton Mifflin Company. EuroCatFancy. (2011). “Colourpoint Shorthair.” EuroCatFancy.de.